Cloud computing is a term used to describe the different types of computing concepts which involve a large number of computers connected via the internet. Sometimes, cloud computing is also considered as a distributed computing over a network and means the ability to run a program on many connected computers at the same time. This phrase, “cloud computing”, is also used to refer to network based services which appear that they are being provided by real server hardware, where in fact they are served by virtual hardware. Such virtual servers do not have a physical existence and thus can be moved around anywhere and scaled up as per the requirements. Here is where the “cloud” really comes from. 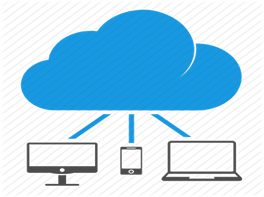 We are one of the best Cloud Computing Companies in India, Cloud Computing Service Providers in India.